This is such a flavorful simple dish that I do not know why I did not make it sooner. I think I was a little intimidated by the tempeh, since I had never used it before. Silly me. I rarely make things more than twice, but this just might make it on a regular rotation. You can omit the tempeh and increase the mushrooms if you like. I would triple the amount of mushrooms if you do so. 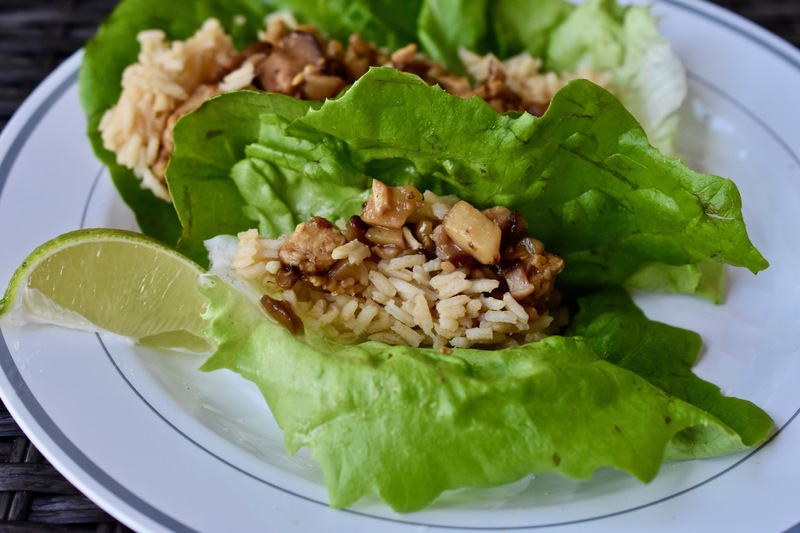 These lettuce wraps would be great for a crowd. 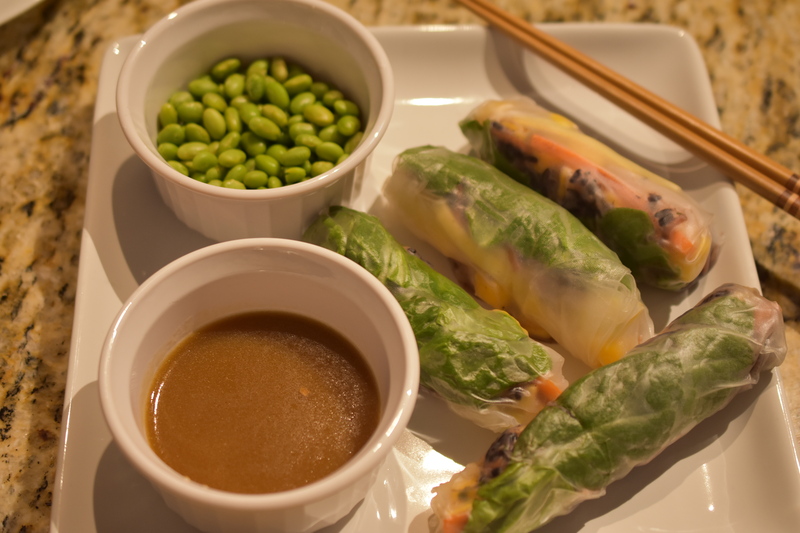 Make some with Forbidden Rice Spring Rolls and Peanut Sauce and you have a wonderful meal. Make the Chinese Brown Sauce first. You can even make this 1-2 days in advance. I made two recipes of the Chinese Brown Sauce because it is that good, and the mushrooms and tempeh soak up the sauce. I had some leftover, however, if you like to spoon it on top of the lettuce wrap go for it. Note: The Chinese Brown Sauce is a good one to keep in your refrigerator at all times. It is great for stir-fries, Asian noodles or just as a dipping sauce for spring rolls. It really is that good. Rinse the tempeh and then steam for 15 minutes. The steaming softens the tempeh, making it more like a sponge to soak up the the flavor you will be pouring on it. Make the Simple Brown Rice. While the Simple Brown Rice is resting; add the tempeh, mushrooms and water chestnuts to a large skillet. Cook over medium-high heat stirring constantly. I use a ceramic non-stick skillet. If you do not have one, make sure you have some vegetable broth on hand in case the tempeh-mushroom mixture starts to stick. Just add a little vegetable broth if this happens and it will loosen the tempeh-mushroom mixture from the skillet. The Tempeh-Mushroom mixture cooks very fast. It is done when you see that the tempeh is golden and the mushrooms have reduced. Reduce heat and add the Chinese Brown Sauce to the Tempeh-Mushroom mixture. Thoroughly stir so that the sauce completely coats the Tempeh-Mushroom mixture. Assemble wraps and add a squeeze of lime. The lime really enhances the flavors of all the ingredients. 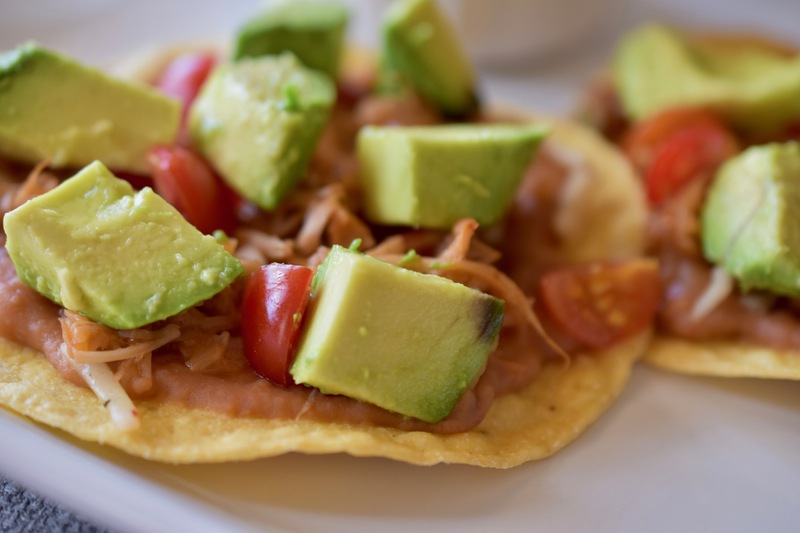 These tostadas are quick and simple to make. They would also be great for appetizers or an after-school snack. I served ours with a sliced fresh peach for lunch. You can make them as simple or elaborate as you want. There really are not any rules for these. Let your imagination go wild. In a medium sauce pan add refried beans and salsa. Stir beans and salsa until well combined. Cook over medium heat, until bean mixture is heated thoroughly. Set aside. Line a baking sheet with parchment paper or a silicone mat. Place tostada shells onto mat. 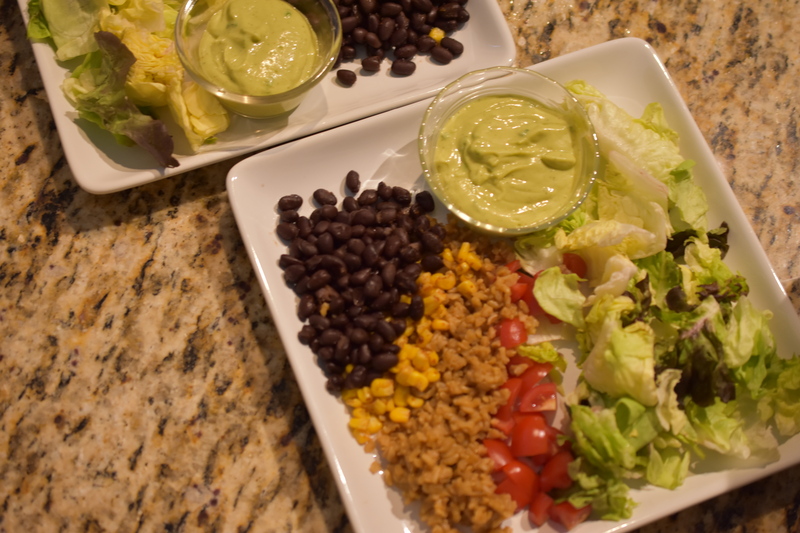 Spread bean mixture onto tostada shells. Layer jackfruit on top of the bean mixture. Scatter a few pieces of tomato on the top of the beans and jackfruit. Bake in the oven for about 5 minutes. Remove from oven and top with chopped avocado. This is another recipe that will be in my cookbook. I thought I’d give you a little sneak peak. It is perfect for an after-school snack or for an appetizer to an Italian dinner. Either way it is delicious. Another thing, there are only four ingredients. 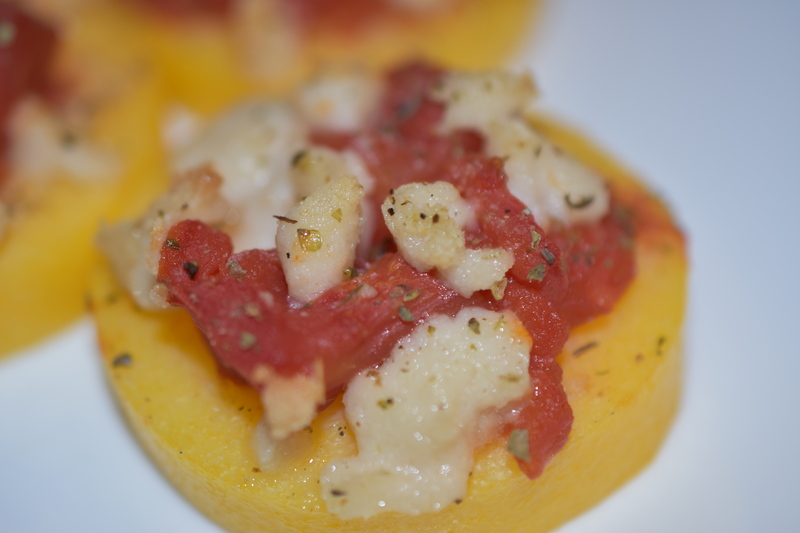 Slice polenta into 1/2-inch rounds. Place polenta round on prepared baking sheet (parchment paper/silicone mat). Sprinkle All-purpose Seasoning on top of the rounds. Layer diced tomatoes and pieces of the mozzarella. Sprinkle all-purpose seasoning on top of the tomatoes and cheese. I have been thinking about making these chips for weeks. I have been craving chips, which is very unlike me, but it is what it is. This is my solution for the crunchy chip craving. Oh yeah, it is another way to get more veggies in. I recommend using a mandolin so that you get precise even cuts. Also, it is a whole lot faster than trying to slice them by hand. You can get you a good mandolin for under $50. It just might be worth the investment. Note: The Smokey Southwestern Seasoning is for sale on my store page, or you can make it yourself and the recipe is found in the basics category. Mix together flour and seasoning in a large bowl. Slice zucchini into quarter sized thickness. Toss zucchini into the seasoning mixture to coat. 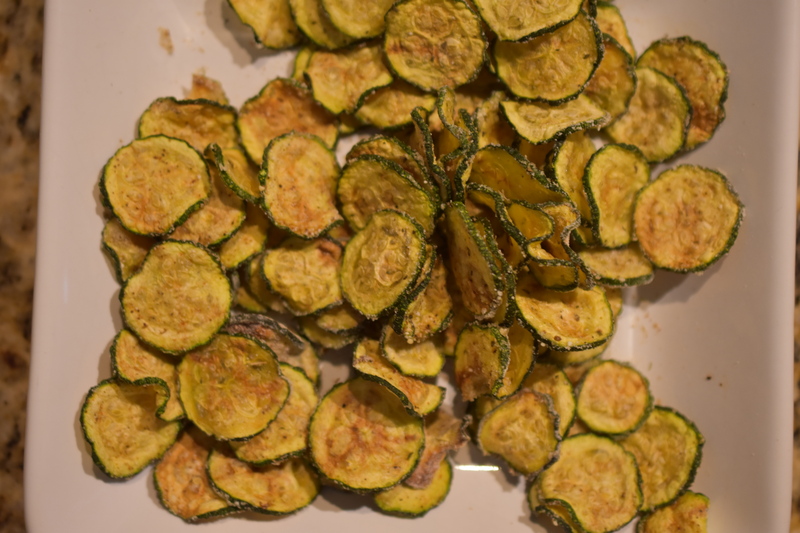 Spread zucchini coins onto a prepared sheet pan (parchment paper or silicone mat). Bake zucchini coins in 10 minute increments, turning each time. This will take about 30 minutes. Do not let them burn or over brown, otherwise they will taste bitter. Trust me on this. They will crisp up as they cool. I promise, these are worth the effort. Make it a fun time with your children. They can toss the zucchini coins into seasoning mix, or they can layer them onto the baking sheet. Serve with your favorite dip or salsa, or all by themselves. We ate them right of the oven. That is why there is hardly any left on the plate for the picture. Note: You can change the seasoning up with my All-purpose Seasoning or my Savory Seasoning. All the seasonings are equally good. Note: You can also make these in the microwave. The last Spring Roll recipe I brought to you was made with Quinoa. This new recipe uses Forbidden Rice or Black Rice. Forbidden has a wonderful unique flavor. I also used the Forbidden Rice on a salad. Anyway you serve it it is delicious. 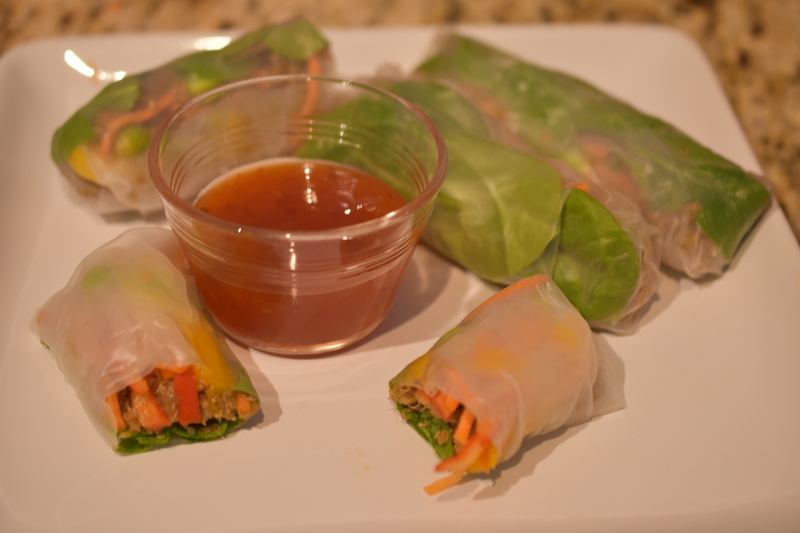 These are easy to assemble once you get the feel of the rice paper wraps, and you do not over soak or fill them. Spring Rolls are a favorite in my house. Once you try these I think they will be in yours too. Lay out your ingredients for easy assembly of Spring Rolls. Soak each rice paper for about 15-20 seconds (just so that the rice paper is pliable) as you make each spring roll. Lay out spring roll unto work surface. Layer ingredients. Fold sides inward (like the sides of an envelope). Start from the bottom, tuck and roll ingredients, making a tube. Set aside. Repeat. This was the first time I have made Spring Rolls. By the time I finished I surprisingly got pretty good at rolling these out. I have always liked spring rolls. They always seem to be a bite of freshness to me. Especially, since these are not fried. They are light yet fairly filling. I made these with quinoa cooked in vegetable broth. I like to think I am adding nutrients and more flavor to the quinoa by cooking it in vegetable broth. The reason for the quinoa is that I wanted to pack in more protein into the Spring Rolls. I also add edamame, for the same reason as the quinoa – protein. Then some greens and crunchy vegetables. You cannot forget the mango for a sweet little bite. These Spring Rolls are packed with a nutritious nibble of delectable goodness. By combining all of these ingredients you get your, sweet, crunchy and a little heat all in one bite. Note: Use a large bowl/pan to dip the wrappers. Just dip them long enough to make them slightly pliable. They tend to continue to soften. If you soak them too long they will tear and fall apart. There is no need to warm the water, room temperature works just fine. Also, dipping your fingers in the water helps to work with the wrappers. Make sure you have all your ingredients in place ready to assemble your spring rolls. I made my Spring Rolls on a cutting board. Sprinkle some water onto the cutting board. Soak one Spring Roll Wrapper at a time, as you assemble each Spring Roll. Remember it only takes about 5-10 seconds, just enough so they are pliable. Lay out flat onto the work surface. Layer some leaves of the greens into the center of the wrapper. Spoon quinoa on top of the greens. Layer carrot shredded, pepper, edamame, and mango. Fold sides into center of wrapper. Fold bottom of the wrapper over the filling. The wrapper should overlap onto top of wrapper. Roll as tight as you can so that it looks like a stuffed tube. This takes some practice. It is okay if they are not perfect, they taste great and they will be gone in a flash. Serve with some Sweet Chili Sauce. The first bite we dipped into the sauce, then we would spoon the sauce into the roll so it dripped into the filling – Yum! 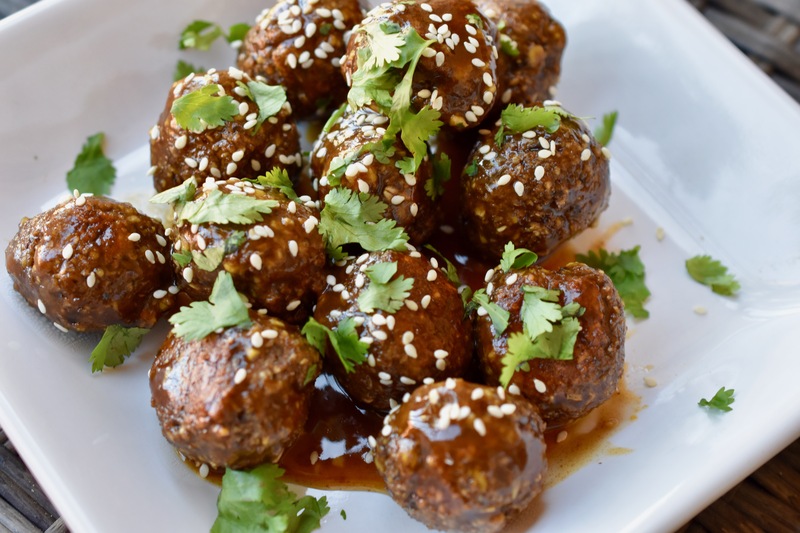 I made these so I could have the Game Day Meatballs that I have made for many Super Bowls or special occasions with the rest of my family. I usually make the meatballs for parties, Super Bowl, Christmas Eve and when I need to make a dish for a large group. 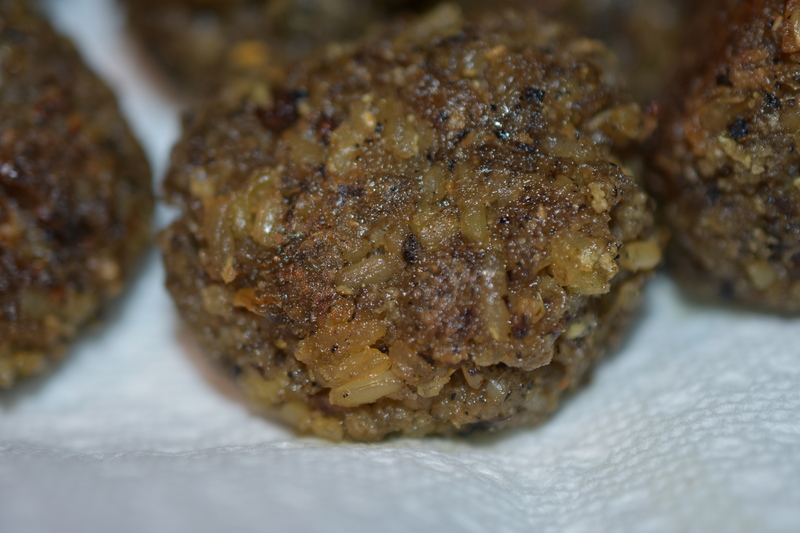 Instead of the usual beef or turkey used for meatballs I decided to make a vegan meatball with portobello mushrooms and brown rice. The recipe is easy and can be finished in the oven. In a large dutch oven add onion and portobello mushrooms. Cook over medium-high heat until onions are soft and lightly browned. Add broth as needed to keep from sticking. Add garlic and cook 3 minutes more. Transfer onion mixture to food processor. Add rice, bread crumbs, flour and all purpose seasoning. Pulse until the mixture makes a dough like consistency. Form into meatballs. Let meatballs rest for about 30 minutes so that they firm up. Line baking sheet with parchment paper or silicone mat. You can spray the meatballs with some oil if so desired. Bake for 15 minutes. Turn meatballs over and bake for 15 more minutes. Remove from sheet pan and drain on some paper towels. The truth is I made this up for a meal for myself. It wasn’t this pretty, yet it is just as tasty. This is a little bit more elevated to the original Warm Spinach-Artichoke Dip just by switching out the base ingredient. These would be great for small parties : Baby showers, Dinner parties, and even a Girl’s Night In. There are so many possibilities. I have a secret for you, but you can tell anyone you want. 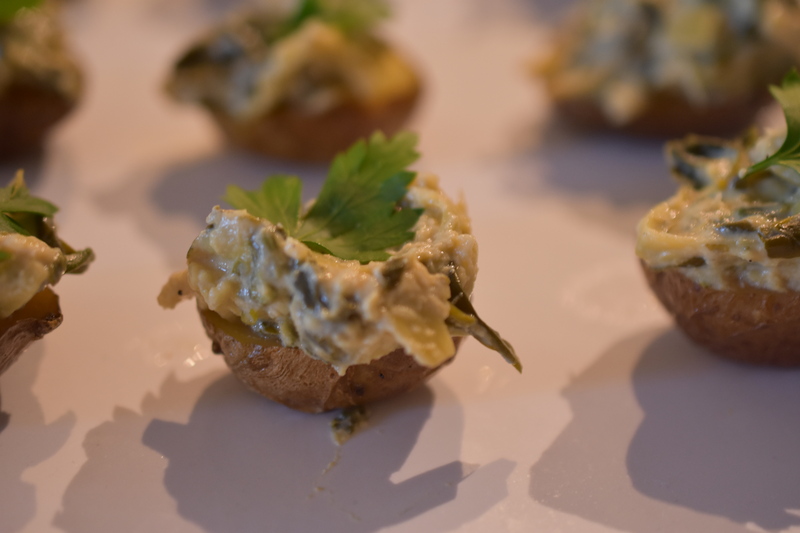 I used leftover roasted baby potatoes for these little delectable bites. The combination is … it is so hard to put the right words for these little bites. They are that good and they look pretty. I promise people will think you worked really hard. I made these a day ago. All I had to do was warm the spinach dip and baby potatoes in the microwave and assemble. However, they are just as good cold. Slice as many Roasted Baby Potatoes as you think you will need. I would use about 4 halves per person. Warm in microwave (if using leftover, cold potatoes). Otherwise, slice potatoes in half when you are able to handle them. Warm Spinach-Artichoke Dip in microwave until heated through. Length of time depends on your microwave. Assembling is extremely simple. I like to give the potatoes a light smash, just enough to give them a slightly flat base. This helps the potatoes stay upright. Put a dollop of dip on top of the potato. I used a teaspoon, however you could use a snipped ziplock bag and pipe it onto the potato. That would probably be easier. Garnish with a fresh parsley leaf.